For my August journal quilt, I continued with my yearly theme of “Happenings and Highlights.” The goal of each journal quilt is to reflect positive things that happen during the month so it can be a tactile, quilted image that brings back happy memories and can be looked at when I need encouragement. The thoughts that kept coming to my mind when I was thinking about the quilt were the hummingbirds that have been visiting the feeder. Every day the hummingbirds have been at the feeder in the backyard, and it seems like that’s been a daily topic of discussion and excitement. 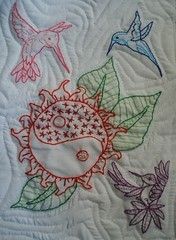 So, for my quilt I looked on the internet for black and white images of hummingbirds; and found several that I liked. I needed an image for a flower, and happened to see a free embroidery pattern on Flickr. Taking these elements, I modified their sizes, printed the images, and cut them out. I arranged them onto a 9” x 12” piece of white fabric and then traced the image onto the fabric with a disappearing ink pen. The entire design (the hummingbirds and flower) are all hand-embroidered using the back stitch, straight stitch, seed stitch, crown stitch, and French knots. I machine-quilted the top, batting, and backing together and then wrapped around the backing to create a binding/border. – Competing in the Washington County Fair – My daughters and I competed in the fair again this year. The girls each entered over 20 projects; and I entered 37 projects. The ribbons color that we received the most of – blue, red, white, and pink (4th place) are all represented in the quilt. 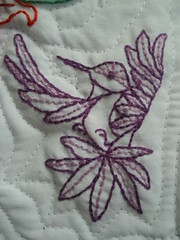 In addition, the purple grand champion is reflected by the purple border, backing, and one of the hummingbirds. The birds also represent each of us and our favorite colors (Sophia is pink; Olivia is blue; and I am purple). – Swimming Lessons for the Girls – For two weeks in August, I took the girls to swimming lessons. They took swimming lessons last summer and enjoyed it; and this year was no different. They enjoyed their daily swim, and passed to the next level. They were both SO excited. The swimming/water is represented by the free-motion sewing in the quilt. It reminds me of waves and the comfort they provide as they move against one’s body. – Lots of swaps on Swap-Bot – I enjoyed participating in a lot of swaps during August, especially the ones where I am challenged to create something new related to a theme and postcard swaps where postcards arrive in the mailbox from all over the world. The swaps are represented by the center half of one flower. I learned how to do the “Crown” stitch for this quilt. I like the trio of spokes on the crown – there seems to be many of them when I look at the flower…just like the many swaps I signed up for and/or are finishing. – Lots of hummingbirds at the feeder – There has been constant traffic at the feeder since the middle of August. Sometimes there’s only one, and at other times there have been up to three at a time. They have sat still while eating (there’s a little perch that goes around the feeder); played in-air chasing games; and perched on what the girls call “The King’s Perch” and “The Prince’s Perch” in the pine tree Sometimes they even hide in the pine tree in “The Secret Hideout Spot” and dive-bomb another unsuspecting hummingbird when it tries to eat at the feeder. Needless to say, the girls [and I] are easily entertained. The embroidered hummingbirds and the flower represent the trio of hummingbirds at the feeder that we’ve been enjoying watching. – Started homeschooling – The curriculum I’m using for homeschooling with the girls this year is called Sonlight. It’s an excellent curriculum that is heavily literature-based. We’ve been doing quite a bit of reading, and enjoying the new books that are part of Sophia’s 4th grade year, and Olivia’s 2nd grade year. The white background of the quilt represents the white pages in the books that the girls and I are reading together. – Severe thunderstorms and lightning + house damage from storms – For one week in August, the weather was in the upper-90s with humidity in the upper-70s. It was incredibly hot and the air was unstable. Each night, there was a huge thunderstorm – each bringing a deluge of rain and a symphony of thunder and an accompanying light show. Some nights were less stressful than others. For many of the storms, the mudroom roof/ceiling began leaking. The storm left the mudroom floor flooded, the window ledge full of water, and canning jars in the closet with water in them (one storm left a good 1” of rain in some of the jars). Normally, I wouldn’t considered this “happiness” or a pleasant memory I want to recall. However, there would be no way in the world that updating and replacing items in the mudroom would be financially possible at this point. Had it not been for the roof leaking, the mudroom would continue to be well-worn and outdated. The storms are represented in some of the machine quilting. There are jagged lines/sharp angles which represent lightening. – Harvesting from the garden and canning peaches – the garden has produced a lot this season. This is the first time we’ve gardened since 2003 when I ran an art and farm camp here at the farm. We have enjoyed organic cucumbers, tomatoes (4 different types), beans, carrots, herbs, rhubarb, and raspberries. The green peppers are almost ready and the potatoes should be ready next month. The pears and apples on the trees should be ripe soon. I canned 14 jars of peaches this month (one is already gone because the girls love peaches!). Sophia helped put the peaches in the jar, and Olivia helped me label them. They were both so excited to be able to help in their own ways with the canning process. The green in the quilt (the leaves of the flower) represent the “green” produce we are harvesting from the garden. – Death of my cousin’s wife: This isn’t a “happy” memory of the month, but it is one that happened. Anne died on August 17th, and had brain cancer. She was 65 years old. The happy memories are ones that I recall from many years ago…before she was affected by cancer. Her memorial service was held at a beautiful chapel that is on the National Register of Historic Places. Its interior is covered in mosaics – the most beautiful I’ve ever seen. There are over 10 MILLION mosaic tiles that make up the pictures. Here’s the link for the chapel which shows picture of some of the mosaics. Anne epitomized Southern graciousness and hospitality. She was absolutely beautiful – inside and out. Leo Buscaglia said, “Too often we underestimate the power of a touch, a smile, a kind word, a listening ear, an honest compliment, or the smallest act of caring, all of which have the potential to turn a life around.” To me, this captures Anne’s spirit and who she was as a person. the fluttering of hummingbird wings move in the pattern of an infinity symbol – a symbol of eternity and continuity. By observing the hummingbird, we see they are seemingly tireless. Always actively seeking the sweetest nectar, they remind us to forever seek out the good in life and the beauty in each day. Amazing migrators, some hummingbirds are known to wing their way as far as 2,000 miles to reach their destination. This quality reminds us to be persistent in the pursuit of our dreams, and adopt the tenacity of the hummingbird in our lives. The hummingbird is a messenger of hope. Anne’s gifts and impact on individuals and the law community will continue on thanks to her tireless determination. She truly was an encourager and supporter – especially to those in need of guidance and hope. Hummingbirds – and what they represent – capture Anne’s gifts and her contribution to making life better for others. She made such a positive difference in the world. So, the hummingbirds in my August journal quilt also represent this wonderful woman who I was so happy to have known, and who epitomized the true meaning of kindness, generosity, and graciousness. Her name was Anne Wilson Grande – an article was written about her and the impact she had on the community. It was in the Star Tribune; and this is link HERE. I love seeing your quilts each month. Its such a wonderful idea that I would love to attempt myself someonday. beautiful birds, and beautiful idea!